I write these words, not wanting to believe them. I walked into my Yeshiva this morning, not wanting to believe the sign was posted there. My eyes scanned the white paper, now so bright in the sunlight – not wanting to believe what I was reading was true. 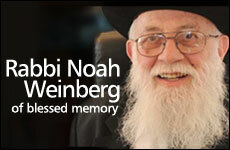 Rabbi Noach Weinberg, the founder and Rosh Yeshiva of Aish HaTorah, was no longer among the living. I was supposed to prepare a thought on the weeks Parasha to post on here tonight, but my mind was unclear, uncapable of doing such. I sat here, three hours ago, holding my head in disbelief, not wanting to believe all this was happening, let alone able to write on the weeks Parasha. It all seemed so distant. I decided I needed some fresh air, a breather, to have some words alone with G-d at the Western Wall. On my way down the stairs, I noticed a group of young men, sitting in the observatory overlooking the Kotel. One had a guitar, the others were singing along – a classic kumsitz (Yiddish for “come sit”, i.e. a small gathering normally involving singing. The crying of their souls, and the answers mine was searching for, became one, as I sat down and joined them, our arms wrapped around each other. Two seats down from me, was a guy in a black leather jacket, knitted kippa almost falling off his head, being held by two guys – he was in tears, screaming, crying, shaking in disbelief. I later learned that Zach, as he is called, had just come to Yerushalayim today for the first time in his life – to study under Rabbi Noach Weinberg in Aish. There was no consolation for him, no words that could soothe his tears. As we sang the famous words from Eichah, “Pour out your heart like water, before G-d”, his tears flowing freely now. The same words describing our nations bitter exile, as our Temple was burned to ashes, by the army of a foreign nation. As women were murdered with their children, men burned alive, and a whole nation feeling their G-d’s wrath. His ears did not understand the words that we were singing, but his soul most definitely did. I had my arm around Zach for two hours, and his new roommate held his shaking body. When a Jewish soul cries, you need not have met it in advance to feel its anguish. “Why do I feel this way? !”, he screamed to the Heavens. I thought of Rav Weinberg. He stood on this very same balcony one day, many years ago. As his eyes scanned the ruins of our holy Temple, of G-d’s dwelling place on this Earth, I can only imagine the tears that were streaming down his sacred cheeks. His pain was no less than Zach’s, yet it was one and the same. His saintly soul, was weeping the state of a Jewish people, who’s large majority, had never even seen the site in front of his eyes, yet alone knew anything about it. He didn’t stop there though. Suffering, crying, pain – are a must. Yet, there reaches a point when one must move on, and take action. I looked to my left, and saw the building of Aish HaTorah’s world headquarters. Action he did take. In his merit, thousands and thousands of Jews have come closer to their roots, to discovering why it is they feel like Zach did tonight, without even understanding why. After assuring Zach was well taken care of, I hurried down the remaining steps to the Wall, for my long-overdue talk with G-d, yet one which was only enhanced by what I had just experienced. “An eternal love, You have loved the House of Israel with. Torah and mitzvot You have taught us. Therefore, our G-d, when we lay down and arise, we will converse in Your Torah, and rejoice and be jolly in your in the words of Your Torah. For they are our life, and the length of our days, and in them we shall dwell day and night. And so, your love you well never remove from your Nation Yisrael, forever. Blessed are you Hashem, who loves His Nation Yisrael, Amen! I took my three steps back, after praying, in tears, feeling so tiny underneath the looming Wall. I couldn’t believe it – was the Rosh Yeshiva, Rav Weinberg really gone? The cold wind blowing against my face, my tears confirming the sad truth. Yet, as I looked at the Wall…I noticed, that it too was wet- for it too was mourning the great loss of the Jewish people today – is it not for that that it is called, the Wailing Wall? May Rav Weinberg’s merit stand for us, and our children forever, and may we only increase in our learning of Torah and Mitzvot in his honor, so that he can look down at us proudly from his seat near G-d.
RabbiYoni.com - keeping you connected with the latest from Rabbi Yonatan Halevy!